Bugatti Chiron & Juan Pablo Montoya Set A WORLD RECORD 0-400-0 KMH! - Muscle Cars Zone! 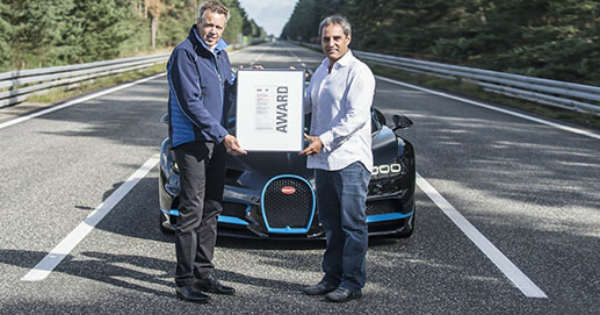 Bugatti Chiron & Juan Pablo Montoya Set A WORLD RECORD 0-400-0 KMH! Check out this amazing video where Bugatti Chiron & Juan Pablo Montoya Set A WORLD RECORD 0-400-0 KMH! The successor to the legendary Bugatti Veyron, the new model Chiron already started setting records! This time you can see the former Formula 1 and Indy Car race driver Juan Pablo Montoya behind the steering wheel to set a new record for acceleration from 0 to 400 km/h and again stopping up to 0 km/h. The beastly Bugatti Chiron took 41.96 seconds to hit 400 km/h and then stop to 0 km/h. This test required 3,112 kilometers. Actually, the speed of 400 km/h was hit in 32.6 seconds and 2,621 meters, so Juan Pablo Montoya pressed the brakes immediately after achieving 400 km/h and thanks to the titanium clips and special carbon discs and the huge rear spoiler the car set the record. This is one of the first records set by Bugatti Chiron, and they will try to set a record for the fastest serial car in the world in 2018. Probably they will need more testing and preparation for that huge move. The new world record was supervised and certified by SGS-TUV Saar, company that works with testing, inspection, certification and verification . However, the official result should be confirmed in Frankfurt, Germany. Actually, Juan Pablo Montoya not only set the WORLD RECORD 0-400-0 but he surpassed the previous Veyron’s top speed of 407 km/h, driving 420 km/h in the new Bugatti model. He was wearing normal clothes and no racing suit and helmet.